Background: Expression vector is an important component in the production of therapeutic recombinant proteins. Most of the commercialized expression vectors apply antibiotic-based selection system. Meanwhile, World Health Organization highly recommends for the alternative system due to its potentials to cause spreading of resistance gene and hypersensitivity to some people. Methods: In current work, we developed an expression system for Escherichia coli using the toxinantidote system in two separated plasmids. An antidote gene (ccdA) with its natural promoter and terminator was constructed in a plasmid (pDCSAsod) containing a DNA fragment encoding recombinant superoxide dismutase from Staphylococcus equorum (rMnSODSeq) as a model. The gene expression was directed under T7 promoter and regulated by lac operator. The toxin gene (ccdB) was located in a separate plasmid (pDCSB) under PBAD promoter. This study aimed to study the growth profile of the host in the presence of both plasmids, to determine plasmids stability, and the effect of the toxinantidote system on rMnSODSeq production and activity. 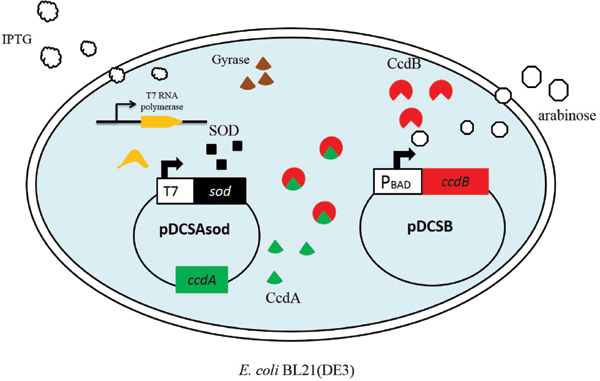 Results: The presence of both plasmids did not affect the growth profile of E. coli BL21(DE3), while the plasmid stability was 94% for pDCSAsod and 68% for pDCSB at the end of protein production time. The yield of purified rMnSODSeq was 3.2 mg/ml and the enzyme was shown to be active by a zymography assay. Conclusion: In conclusion, for the first time, we show that toxin-antidote system in two separated plasmids has the potential for the production of recombinant therapeutic proteins and is more flexible in choosing the E. coli strain compared to established chromosomally integrated toxin-antidote selection system. Keywords: ccdA, ccdB, expression vector, plasmid stability, therapeutic recombinant protein, toxin-antidote. Keywords:ccdA, ccdB, expression vector, plasmid stability, therapeutic recombinant protein, toxin-antidote. Abstract:Background: Expression vector is an important component in the production of therapeutic recombinant proteins. Most of the commercialized expression vectors apply antibiotic-based selection system. Meanwhile, World Health Organization highly recommends for the alternative system due to its potentials to cause spreading of resistance gene and hypersensitivity to some people.